This new Metabolic Finishers Program uses a powerful and effective superset system with ZERO cardio and is already becoming a legend with Finishers Fans. The Super 6 Abs finisher (Finisher #7) that will work your abs harder than any crunch or sit-up, and of course, with no cardio. This one-of-a-kind Finisher program was one of the tougher programs I put together as every metabolic finisher is in superset fashion. But that means you can be like thousands of other men and women and burn more fat in less time with these unique, but addicting metabolic finishers. P.S. There is NO RISK at all for you to try this Metabolic Finisher program. 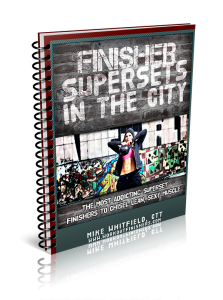 If you are not thrilled with Finisher Supersets in the City in 60 days, let us know and we’ll refund every penny. Your satisfaction is 100% guaranteed. My workout programs have already been seen on Men’s Health, Turbulence Training and used by thousands of men and women, and I guarantee it will work for you, too.